Every year a group of literary, educational and free speech organizations, including the American Library Association, celebrates the freedom to read with Banned Books Week. This year, Banned Books Week runs from September 22nd through the 28th and we'll help kick it off on Sunday the 22nd at 2:00 with the return of Books on the Chopping Block. City Lit Theater Company will return to the library to present a highly entertaining concert reading of excerpts from the top ten most frequently challenged books of 2012. Since 2006, City Lit - a Chicago theater specializing in staged adaptations of literary material - has teamed up with the American Library Association’s Office of Intellectual Freedom in honor of Banned Books Week. Its actors perform Books on the Chopping Block at special events, libraries, and bookstores in and around Chicago all week long. The performance runs 50 minutes and is followed by a discussion. While the program is intended for adults, children in approximately grade 6 and up are welcome to attend. 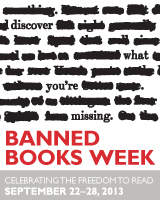 For more information about Banned Books Week click here.